Langley Garrett discovers Greek gods and the myths and legends that surround the lost city of Atlantis are not ancient history to those who arrange his abduction. Within hours of being drugged and restrained, he finds himself imprisoned on a remote island, with no clue as to why he was kidnapped. The Sons of Cleito, a mysterious group whose ideology and beliefs are guided by Greek mythology, believe he is a spirit, crucial to their future, and immediately begin his indoctrination process – starting with explicit evidence that his wife is not only a member of The Sons, but also that she is an adulteress, and has been working with their enemies to destroy The Sons of Cleito. Yet, before he has time to understand the ugly truth about his wife, he is abducted once again during a violent commando raid on the island and is rushed aboard a submarine for questioning – about his wife, and a long-forgotten letter from his dead mother. Garrett learns very quickly that he is in deep trouble, but has no clue as to why he is being accused of involvement in an international terrorist organisation. Later however, after weeks of interrogation and beatings in a desert prison, all he knows with any degree of certainty, is that he will be lucky to stay alive for very much longer. Read about Langley Garret’s abductions, mysterious misfortunes, Greek mythology, gods, deities and eternal secrets – and why history can only ever repeat, in Eyes That Could Kill, a mystery thriller. I love a story that starts with “The internal organs located in and around the belly, while serving most notably as an efficient set of composting and sewerage services, happen to possess another completely unrelated and totally mystical function…” So this story resounds with incredible insights into how we as humans process our world, how our guts and inner visceral organs, communicate to us to let us know about threats and dangers. The author has captured well the sense of this inner knowing, its upsides and downsides. And this makes the story so much more engaging and philosophically insightful. It’s a great read, keeps you guessing and involved. It’s also quite a deep read, exploring the structure of human and societal power structures, our drives for wealth, acceptance, power and belief. I enjoyed it immensely and look forward to reading more by this author. A reader may choose Eyes That Could Kill because they enjoy reading mysteries about ancient Greek and its mythology, maybe even Latin mythology, but even if that isn’t the case, Chapter One will hook any reader immediately. It is one of the most intriguing first chapters I’ve ever read. The main character, Langley Garret, is viewed as a regular run of the mill guy at one point, then becomes a complicated part of a political scheme when he is kidnapped. Readers have no idea what is going on because poor Langley doesn’t have a clue either. In Derek Haines true form developing his characters, his phenomenal writing style keeps his readers questioning the same things Langley is confused about. In Eyes That Could Kill, Langley becomes our best friend. We route for him to figure out his predicament, that is while we are internalizing (pun intended) why he thinks in terms of his internal organs, especially during some of his less friendly kidnapping ordeals. Derek Haines showcases his expertise in letting his readers decide for themselves what his characters are all about. He is at his best writing Eyes That Could Kill because it has the most unpredictable ending for Langley Garret. 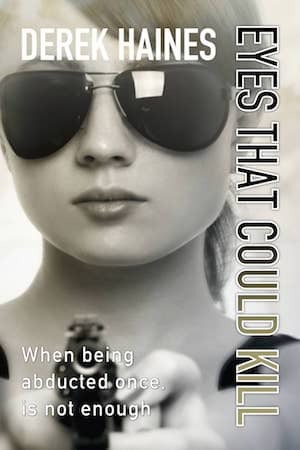 Mystery lovers will appreciate reading Eyes That Could Kill by Derek Haines, especially if they want to know if Langley Garret is successful unraveling his kidnapping. Originally published in two books, The Sons of Cleito and The Few.